A few years back, a young single woman from our church had to move out of her apartment on very short notice. The only new place she could find where she could move in quickly was in the country. The house belonged to another church member, but it was old and had been uninhabited for years. Every week at church, our city girl in the country would have a story that had me in stitches. Her first few nights were spent with mouse traps snapping all night. When a mouse got its tail caught and squealed for all it was worth, she couldn’t bring herself to kill it. Instead she picked it up with pliers, took it outside, and let it go—so it could come back in. One morning she got ready for work in her cute business attire and stepped outside to see her landlord’s cows surrounding her car. As they licked her windshield, she tried to shoo them away. Once they got out of the way, she couldn’t see out to drive because of the slimy tongue streaks. 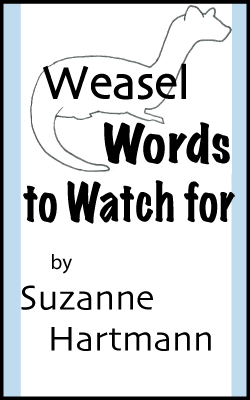 Then the skunk got in her dryer vent under the house, sprayed, and died. She had to vacate the premises and stay in her landlord’s guest room for three days. Another friend used to have a hobby farm where the rooster would flog her every time she stepped outside. No one else—only her. She also had pygmy goats, so I picked her brain for goat hi jinks as well. I put all of this animal mischief plus a few made up incidents into Counting on the Cowboy, where the heroine is a city girl temporarily staying at her sister’s dude ranch in the country. Devree isn’t outdoorsy, hates getting dirty, isn’t fond of smelly farm animals, and I had fun tormenting her. 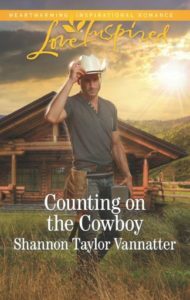 Award-winning author Shannon Taylor Vannatter writes contemporary Christian cowboy romance and has over a dozen published titles. 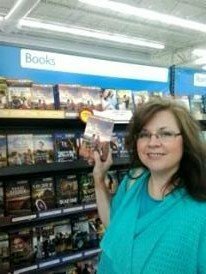 A romance reader since her teens, she hopes to entertain Christian women and plant seeds in the non-believer’s heart as she demonstrates that love doesn’t conquer all—Jesus does. About Counting on the Cowboy: Texas Cowboy Brock McBride knows better than to fall for a city girl. She’ll leave and break his heart—just like his ex-fiancée did. But his job at a dude ranch requires working alongside Dallas wedding planner Devree Malone. And despite fierce resistance, he’s falling hard. With Devree’s business back in the city, can he convince her she’s found her home … with him? Comment to enter the drawing for a copy of Counting on the Cowboy. Ten copies will be split among names drawn during the blog tour from March 13 – April 10. One winner will get to pick the theme for a custom-made memory board personally crafted by the author. Deadline April 20. 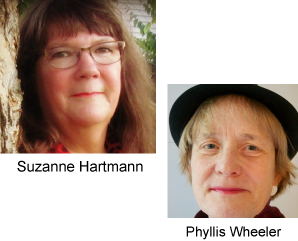 Winners will be revealed on the author’s blog on April 21. Go to my website http://shannontaylorvannatter.com and sign up for my newsletter to enter more giveaways and get a free book download. these sound so familiar as I grew up on a farm too and had the same things happen to me except the skunk! Thankfully none of it has happened to me, Shelia. I grew up in the city, then moved to a farm when I was twelve. I’m still not fond of farm animals. Especially cows. Two of them have chased me and they surrounded my cousin in the outhouse at our grandparents’ once. I should have put that in the book too. Maybe one in the future. I always wanted to live on a farm when I was a kid….,I sort of blame books for that one though. I probably wouldn’t have fared well though. I always wanted a horse, Jennifer. So when we moved to Arkansas when I was 12, I got a horse. All was well until he got fat, the saddle didn’t fit right, and he ran back to his feed trough. The saddle turned sideways with me and I landed on my shoulder and neck. I couldn’t raise my arm for months. I rode after that, but only with my dad holding the reins with that horse. He was young and lively. I’ve ridden horses on my own since, but older, calm ones only. I’ve never spent time on a farm so I can only imagine the torture Devree has to go through!! Both sets of my grandparents had farms and we visited every summer. I’ve picked strawberries, blackberries, peaches, and okra, and dug potatoes. Hot, prickly, and yucky. When we moved to Arkansas when I was 12, my parents bought cows. They had horses and pigs for a while. They still have cows, a horse, and a donkey to keep the coyotes away. We live across a hayfield from them, so the farm experience is pretty close. Especially when the wind blows. Wow Kelly, you’re brave. When my parents moved to Michigan when I was a baby, they didn’t have anywhere to live and had to find an apartment. The same thing when they moved to Indiana, then Illinois, and finally Georgia. I can’t imagine taking off cross-country without a home waiting for me. My son would have helped you out with the turkeys. He loves to hunt and turkey season is his favorite. See I would have to move after the skunk lmao, one of our dogs got stayed once when I was a kid and I threw up from the smell. If I get even a wiff of a skunk I start gagging.